The Last Midnight is Gary Wenkle Smith’s first novel. It might make interesting reading to the Sentinel’s readers on several grounds. Of note is that Smith is a San Bernardino personage through and through. He is the son of Nancy E. Smith, who was San Bernardino County’s Fifth District Supervisor from 1956 until 1976, the second woman to serve as county supervisor in the county. Smith, who grew up in San Bernardino and attended Pacific High School, San Bernardino Valley College, and Cal State University San Bernardino, in his own right has gone on to have a storied law career, during which he has practiced criminal law almost exclusively. He has had notable success in defending individuals charged with murder, scoring acquittals for a host of his clients who were looking at a lifetime in prison or potentially the death penalty. He remains in practice with an office in San Bernardino, a stone’s throw from the new San Bernardino Courthouse. 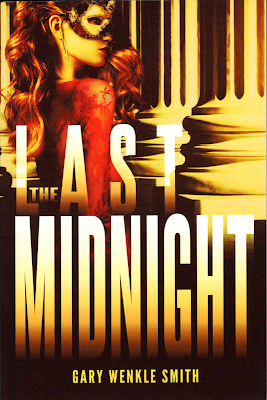 The Last Midnight takes as its subject matter a murder case, perhaps not too unlike some of the cases Smith has himself been involved in defending. The central character is an attorney, Patrick Moynihan, practicing law in fictional Danbrier, located in fictional Danbrier County, both of which bear too many obvious similarities to San Bernardino and San Bernardino County to make believable the author’s halfhearted assertion, made directly to this reviewer, that no actual correlation between the fictional and the real was intended. Moynihan, as well, bears a somewhat sneaking resemblance, at least in certain aspects, to the author. The novel opens in the immediate aftermath of a murder that has occurred in a fourth floor room in a Danbrier hotel, as investigators from the Danbrier Police Department and the sheriff’s department have arrived on the scene. Horrifically bludgeoned is the lover of the wife of the ne’er do well son of one of Danbrier County’s wealthiest citizens. Hotel security video footage has captured images that indicate, without actually proving, it is the wealthy young man who wielded the baseball bat used to beat the victim do death. Subsequently, further evidence, consisting of DNA findings implicating the young man, come into the possession of the sheriff’s department’s crime lab. Moynihan has been retained by the defendant’s father to represent his son. A hard-charging, albeit alcoholic, prosecutor is gunning to convict the defendant and send him to prison for life. As Moynihan and his top-notch investigator carry out their own investigation into the facts for the purpose of being able to mount a convincing defense, they unearth further indicators that Moynihan’s client is a sadistic sociopath and other convincing evidence that he is guilty of the crime he has been charged with. Smith offers a graphic display of the defendant’s depravity, which includes an insatiable affinity for methamphetamine and a host of other sordid proclivities. The defendant’s character flaws do not keep Moynihan from living up to his professional commitment to offer his client an aggressive and effective defense. While he is working toward that end, playing within the rules and the ethical code of conduct he has adopted to justify to himself that he has buttered his bread and established a vaunted professional reputation by getting acquittals of some individuals who have been charged with the most heinous of acts, Moynihan and his investigator learn that someone within the law enforcement hierarchy is militating on his client’s behalf, obfuscating, losing, contaminating or altering, if not outright destroying, the evidence which Moynihan recognizes would under normal circumstances once presented in a court of law, his own spirited legal defense notwithstanding, convict his client of the crime he almost assuredly committed. Soon it becomes clear that his client’s wealthy father is using his financial means and his connection to the corrupt county sheriff to compromise the professional and ethical integrity of the backbone of Danbrier County law enforcement – the sheriff’s department’s investigators, evidence technicians and its crime lab personnel – in a push to have Moynihan’s client exonerated. That corruption of the law enforcement establishment bleeds over into the district attorney’s office, where the alcoholic-but-ever-determined deputy district attorney is himself being pressured to throw the case. It is this element of Smith’s narrative that is the most compelling and poignant and which makes The Last Midnight for me worthwhile reading. Long before he decided to reinvent himself as a novelist, Gary Wenkle Smith was an attorney, indeed a pretty good one. It is a comment upon our society and our era – I will leave it to the reader to decide whether it is a favorable or unfavorable one – that Smith and his professional colleagues, when called upon to answer, even outside the courthouse, whether their clients are guilty or innocent will with a show of the utmost sincerity and conviction assert that those they represent are absolutely innocent. Reflexively, lawyers will insist that is the case even when a showing of the facts in a court of law has already established or will in time demonstrate, and a verdict has settled or will decree, their clients are guilty. It is as if engaging in the creation of fiction has freed Smith to tell the truth about his profession, or at least tell the truth in a way he cannot when he is in a court of law. Smith succeeds in his fictional setting in posing questions that go right to the heart of the validity and morality of the venerated American Justice System, one that relies on the adversarial principle, a crucible in which a verdict, or what is supposed to be the truth, is crushed between the mortar and pestle of the prosecution and the defense, either side of which is free to engage in the application, or misapplication as it were, of truth, its own version of truth, misrepresentation, sleight-of-hand, half truth, deception, quarter-truth and even outright lies. The theory is, and all of those participating in this system just seem to accept, this presentation of facts, factoids and falsehoods, what is real and what is not, and what is truth and what is not will enable a jury of the accused’s 12 peers to ascertain some semblance of “real truth.” In this sense, Gary Wenkle Smith manages to inculpate his other self – the lawyer – and all of his fellow attorneys, prosecutors and judges in a philosophical indictment at least as scathing as any actual criminal filing down at the courthouse. A key element of the plot of The Last Midnight is the deviation from the legal system’s adversarial principle, when sheriff’s department personnel and then the district attorney’s office, at the behest of corrupt higher-ups, undertake to assist the accused, which is the opposite of their traditional role. This creates an imbalance, one that registers with Moynihan, committed as he is to his defined role within the adversarial system. It raises the quintessential question of whether the system, which accepts falsity as one its key components, can ever lead to truth, and whether a system that openly involves the display of falsity, indeed embraces it, can render justice. One ponders whether and how often Gary Wenkle Smith the lawyer, in the quietude of his own reflection while engaged in his life’s work, struggled with these questions.